I’ve written before of my teenage self’s rejection of Ruth Rendell’s Inspector Wexford series and my subsequent luke warm appreciation of the books, but last year I rather enjoyed book 22 of the series, The Monster in the Box, though I did think it the end of the series. I was curious then when a 23rd full length Wexford novel was released this year and when an edition narrated by the excellent Nigel Anthony became available I couldn’t resist. Reg Wexford has retired and he is enjoying some aspects of his new lifestyle, especially living part-time in the converted coach house in the grounds of his daughter’s north London home. He and his wife Dora enjoy the change of scenery from their home in Kingsmarkham and Wexford in particular has taken to having long walks around the city (Dora gets her exercise at a gym). However Wexford does miss being a policeman so when and old colleague, Tom Ede, asks him to act as a specialist advisor on a curly case Reg jumps at the opportunity. Four bodies have been discovered in the dis-used coal hole of a house in St John’s Wood; forensic evidence indicates 3 of the bodies have been there for about 12 years while the fourth has only been there for 2 years. Given the house has changed hands several times over this period police are somewhat baffled by the case, especially as there is not much to go on in the way of identification. In most crime fiction some suspension of disbelief is required and here it is that a senior policeman with all manner of resources at his disposal would need (or even consider) relying on a retired person for the resolution to a case however it is made just about believable when the prior relationship between the two is described as being something of a mentoring one. Stretching the credibility further though is the wide acceptance of Wexford by Ede’s younger subordinates, none of whom slow the slightest hint of being miffed at being lumbered with the ageing Wexford as interviewing partner/meddler. Such acceptance of the wisdom of the older person is certainly not my experience of the modern workplace. However, it’s not that hard to put this aside and become immersed in this gentle but satisfyingly complex tale complete with a nicely observed take on several aspects of modern life. One of the things I appreciated most about this book, and its predecessor, was the well-rounded sense we get of Wexford’s personal life including his various familial relationships and his friendship with his old colleague Mike Burden who he has a drink with each time he goes back to Kingsmarkham. A couple of years ago I read the very first Wexford book, From Doon with Death, and I was struck by how little of the personal side of the characters we saw. Clearly a lot has changed in the 40+ years that Rendell has been writing this series. We see the gentle side of Wexford with his various grandchildren and also the distraught parent shines through when one of his daughters is severely injured. As far as the case goes Wexford struggles sometimes with having no official role, he even goes so far as to lament that he is not like the famous amateur detectives of fiction such as Hercule Poirot and Peter Wimsey. However, his imagination is captured by the puzzle of the case and I enjoyed the way he was depicted as figuring out various aspects of the problem, using new technology where appropriate and old-fashioned interviewing techniques when that was called for. Another thoroughly enjoyable aspect of the book is its presentation of London as something of a character in its own right. Via Wexford’s walks (and bus rides, taxi trips etc) we’re treated to an eclectic but quite delightful picture of the city. There are observations about particular buildings, the changes brought by waves of migration and the way a place can go from being a mansion to a slum (and back again) over time. There are things that don’t quite work about the novel too. The idea that a senior policeman could have retired within the last year or two having never sent an email seems utterly preposterous for example and the resolution of the case at the heart of the novel is a bit contrived. But the character studies and observations about the life of a newly retired man make up for these minor deficiencies and I can recommend this book to both fans of the series and those unfamiliar with the characters as you really don’t need to have read the rest of the novels to enjoy this one. I do have to say something about the editing though and not in the way that I usually do when I just want words cut out. Here the book is not too long but it is very poorly edited with names of characters being different in different places, information being repeated unnecessarily (we’re twice told in some detail about the layout of the coach house for example), a character talking of something before the fact is revealed in the narrative and several other errors. At first I thought it was me as I was listening to the book (superbly narrated by Nigel Anthony) but after laboriously re-listening to several passages I realised I had remembered properly and it was the book itself which contained the rather alarming number of errors. 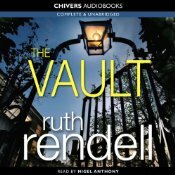 This entry was posted in book review, England, Ruth Rendell. Bookmark the permalink. Yes I saw what Cara wrote and I agree it does seem like another dangling thread…I had visions of the cover somehow being propped up with a stick and then that being knocked loose – thought I might have missed a crucial sentence or two. Bernadette – Thanks so much for an excellent review! I’m sorry to hear of both yours and Maxine’s experiences with the lack of police resources. I had a similar one when our home was broken into (‘though this was years ago). A perfunctory glance was all we got and there was no real effort to get back the things that had been stolen. Glad to be of service Karen 🙂 To be honest I don’t think it’s something I’d have bothered with in print but as an accompaniment to my weekend of attacking weeds, washing windows and other dull but necessary chores it was pleasant enough. As a Ruth Rendell and Wexford fan, I was happy with about half the book, and looked forward to a full unraveling of the mystery. What actually happened twelve years ago, why and how? At the end everything focuses on a young woman, hitherto almost unmentioned, and we are left to guess the rest. The author seems to have been be in a hurry to finish the book. How unsatifactory.